Slipped Disc | Slowest-ever January for new classical recordings? Slowest-ever January for new classical recordings? An editor mentioned she was finding it hard to find new releases for review this month. Others chimed in that the record industry’s output is not much more than a trickle, much of it bottom-of-barrel stuff. On the other side of the till, this week’s US sales figures have gone back to abysmal. Bocelli tops the pile with fewer than 1,000 sales. Second is André Rieu with just over 500. Third is Rachel Barton Pine, a heavily promoted set of Mozart concertos, just 300 sales. For those who looked to Vienna waltzes for a pick-up, the New Year’s Day concert is 12th in the Nielsen rankings, with just 117 sales. These are figures the music biz don’t want you to see. Where was Rachel Norton Pine heavily promoted? The classical industry needs to learn current promo skills. I think you mean Rachel Barton Pine. I’ve seen some promotion of the CD. The moment is soon arriving, when the classical music recording business finally goes extinct. It should not come as a surprise to anyone. Yes, technology has played a very significant role, but the real fault lies with the major players, particularly Universal Classics who, being the worst offender, has run the business into the ground and succeeded in alienating the vast majority of their once loyal consumer base. When I look at the people who are running the business, whether its the new senior management at DG in Berlin, of the top management in London, it is an embarrassment. Sadly, it is a giant ship that is sinking at a fast pace, being commandeered by people who, with few exceptions (less than 5) who really have any true understanding of music, or even any love of classical music. How could anyone have imagined that under such leadership that their business would flourish and succeed, particularly now, when things are already difficult. I don’t think that I have ever seen a bigger bunch of incompetent managers, ever. Not in this business, nor in any other. Have you seen who manages the British Railways….? Looking at the new releases for January….. It just looks quite empty. – Sparsity of new releases in the two of months after the Christmas sales season is not unusual, and not confined to classical music. Look at record-review publications (all kinds) over the last 40 or 50 years; I believe you’ll find that the January and February issues are always the slimmest. – Are these CD sales or CD & digital-file sales numbers? If the latter, they are indeed anemic. If the former, they are just more evidence that the CD market is cratering. – Compared to what? A useful question, here as elsewhere. What were the week’s sales numbers for new pop, country, urban, jazz releases? Were they comparably weak by historical measure? I’ll bet they were. The days of recordings selling by the tens of millions are long gone. Labels are hesitant to put out releases in January because consumers tend to spend their money elsewhere. They are giving themselves the best chance of recouping the cost of making it through sales. With releases also increasingly timed with performances/concerts, perhaps January doesn’t represent a strong month this year. The editor “finding it hard to find new releases” is a bit pathetic. There’s some excellent releases on harmoniamundi (Paul Lewis, Kristian Bezuidenhout), Hyperion (Pip Easthop), Signum (OAE) – all out this month. The larger independents (Hyperion/Chandos) always have a number of releases each month, of a high standard. Also given the proliferation of self-releases there’s always something that’s interesting; perhaps editors decide they are going to review it or not without actually hearing it…. and the Select Music dealer PDF of releases. 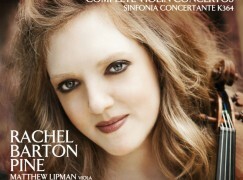 Rachel Barton Pine will be performing in my town this weekend. If she’s like most touring classical artists, she’ll bring along a box of her discs to sell and autograph after the concert. (Even the biggest names, such as Joshua Bell, do this nowadays.) Pine, among many others, also sells her recordings and other products via her website. For quite a while, classical musicians and others whose work is not aired on commercial media have marketed their wares outside the conventional retail network. Do these sales figure in Nielsen and other tallies? Sales at concerts – except in a few venues in the UK (Wigmore Hall for one) – don’t count. If you sell 100 discs at your concert in x Music Club, these will not be reported. And has garnered 4 and 5 star reviews. I’m a big fan of streaming services like Spotify and Rdio (I subscribe to both), and I use them to listen both to unfamiliar composers and new releases before deciding whether to purchase them. Without Spotify and Rdio, I would never have discovered key classical labels like Chandos, BIS, and Harmonia Mundi. Nor would I have discovered composers like Raff, Atterberg, or Stenhammar. Over the past two years, since I started listening to streaming services, I have spent about $300 a year on music (above and beyond the subscriptions), mainly from these labels and their peers and in this kind of slightly-off-the-beaten-path repertoire. As a result, my purchases of new releases has certainly fallen–by as much as two thirds. In fact, I seem to be purchasing mainly new issues in ongoing series to which I’ve already committed (e.g., Fibich on Naxos, or Nielsen on BIS and Dacapo) I’m simply not willing to spend my rather limited funds on something I may not like. I need to hear it to be sold on it (and 30-second clips on the labels’ websites do not suffice). I doubt I am quite a typical classical listener, but I wouldn’t be surprised if there were some others like me whose purchases have gone down as opportunities to sample new releases on streaming services has dwindled.